I don’t know for certain how many of these I’ll do, but we’ll call this Part I just in case. Monster cats have a plethora of magical powers. Although they never appear to be anything more than a normal domestic cat, a monster cat can grow to as long as five feet in length. They have the following spell abilities: Dancing lights (3/day), ghost sound (3/day) and polymorph self (1/day). Monster cats can animate fresh corpses into zombies by jumping over them. They are also capable of walking on their hind legs. A monster cat that lives long enough has its tail split; such creatures, called forked-tails (neko-mata), have 6 HD. About 5% of monster cats are actually lawful in alignment. Basans are 10-foot tall roosters with brilliant plumage and fiery crests. They are capable of breathing cones of ghostfire (15 feet long, 10 feet at base) from their beaks. This ghostfire deals 3d6 points of damage, even to creatures normally immune to fire, because it burns one’s soul. Victims can make a saving throw for half damage. The fox woman is a lycanthrope than can assume the form of a silver fox, a vixen (half-fox, half-nymph) or nymph. Fox women can use the charm person spell on men at will. They dwell in lonely woodlands, accompanied by 1d4+1 charmed males who will do anything to protect their mistress. At least one male is a bujin or fighting-man of 2nd to 5th level. There is a 50% chance that another male is a bujin or fighting-man of 1st to 4th level. There is a 10% chance that one of the remaining males is a shugenja or ninja. There is a also 10% chance the fox maiden has stolen a beautiful infant girl to raise as her own. Gashadokuro are giant skeletons with a burning hunger for human flesh. They attack human beings on sight, trying to grapple them with their massive, bony fingers. If successful, the gashadokuro will attempt to bite their head off (-4 to hit, 5d6 damage) each round. Gashadokuro are created from the bones of people who have starved to death. 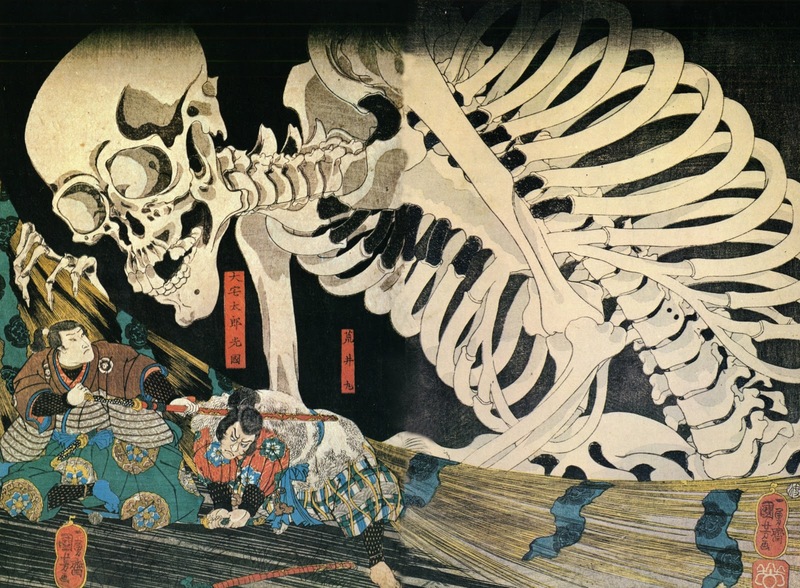 Gashadokuro, despite being fifteen-foot-tall skeletons, are incredibly quiet and stealthy. A one-eyed boy looks like a small humanoid with a single, giant eye and a long tongue. They enjoy frightening people, but despise noise. One-eyed boys are immune to illusions and can see through invisibility. Creatures with fewer than 3 HD must succeed at a saving throw to avoid fleeing from a one-eyed boy. The creatures can use the silence spell at will and can fire a ray that reduces the target’s strength to 3 for 1 hour unless the target succeeds at a saving throw. The weakness ray can be fire once every 3 rounds. Anyone viewing a one-eyed boy must succeed at a saving throw or fall under the effects of a curse for one month. One-eyed boys usually wield bo staves and slings. Awesome! I am always looking for more Japanese inspired monsters and have little skill in creating my own.